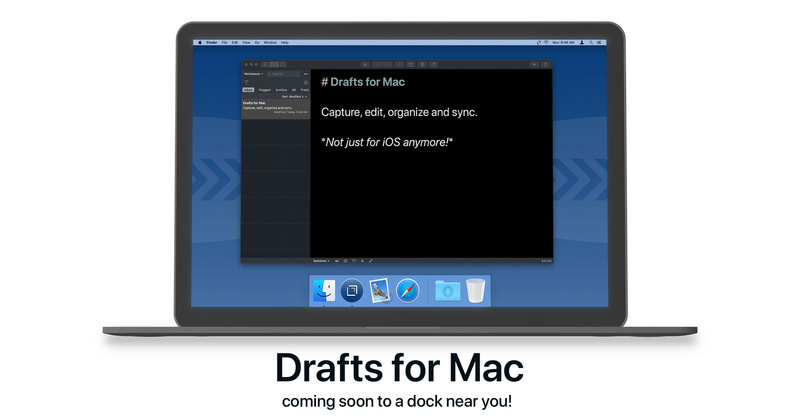 The release date is set for Drafts for Mac for March 26, 2018. Thanks to all those who have participated in the beta and provided feedback! This version is just a start, and we look forward to continuing to deliver more functionality over the coming months. Free download. Similar to iOS version, free version supports creation, editing, sync with the iOS version. Pro subscription available via iOS or Mac, and can be shared across platforms using iCloud. Basically, if you are synching with iCloud, your Pro subscription can be shared the same way. Pro enables workspaces, editor themes and appending/prepending in the capture window on Mac. Requirements: Mac running High Sierra (10.13) or greater. Limitations: No actions yet. Action will come to the Mac, but for now actions are only available on iOS. Thanks again for all the support and hope you enjoy having Drafts on your Macs. It’s made my day to see that this is going to be compatible with High Sierra. My Macbook Pro is rather long in the tooth, won’t run Mojave, but is running High Sierra, and I can’t afford to replace it just yet. I’d let the beta pass by thus far as I didn’t want to come to rely on something I might have to do without until I can afford my long overdue upgrade. Could you please let me know the pricing structure for the pro upgrade? @smithy: See Drafts Pro information. It is the same. If you have an iOS Pro subscription, there’s nothing else to buy. Fire-up the Flux Capacitor Action! Seriously, well done and thanks for all your hard work on this, and a side-note of thanks for maintaining High Sierra support. That settles it! Drafts will be my ”app for the week” in our internal newsletter. It’s hard to even comprehend I have been running a beta(!) for months now without any problems. The checklist facility in combination with excellent search tools has even reduced the need for other ”GTD software”. Downloaded from app store and given five stars. Will write a review in due course.